Gary Cohn's replacement could alter Trump's economic policy direction. On Tuesday afternoon, White House economic adviser Gary Cohn abruptly announced his resignation, leaving yet another major job vacant at 1600 Pennsylvania Avenue. Cohn, who serves as the director of the National Economic Council, stepped down amidst the White House announcing its plans to follow through on tariffs against foreign steel and aluminum. A free-trade Democrat, Cohn served as a stabilizing force in the White House. His forthcoming absence leaves a policy power vacuum as President Donald Trump pushes major trade initiatives. While the White House has not yet announced the president's pick to replace Cohn, names from inside and outside the White House are being floated around. "Will be making a decision soon on the appointment of new Chief Economic Advisor," Trump tweeted Tuesday night. "Many people wanting the job -- will choose wisely!" In a press briefing Wednesday with reporters, White House press secretary Sarah Sanders said she will not be offering a list of contenders. "I can tell you that the president has a number of people under consideration and he's going to take his time making that decision," she said. According to multiple sources, the list of potential candidates includes the Office of Management and Budget direct Mick Mulvaney; director of the Office of Trade and Manufacturing Peter Navarro; economist and CNBC contributor Larry Kudlow; former CKE Restaurants CEO and one-time pick to be Labor Secretary Andy Puzder, and the National Economic Council's Shahira Knight. 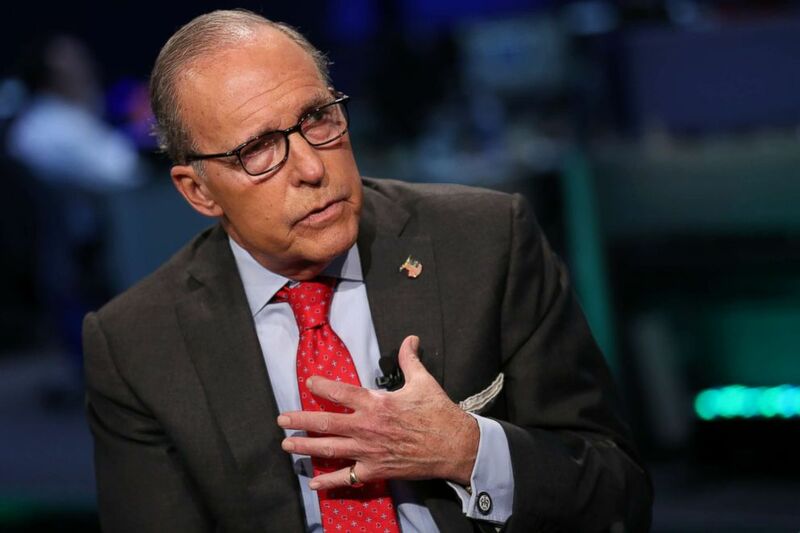 (Adam Jeffery/CNBC/NBCU Photo Bank via Getty Images) Larry Kudlow, conservative economist and former host of CNBC's "The Kudlow Report," shown here in an interview on September 15, 2015. Kudlow is the top choice to replace Cohn, sources tell ABC News. A Reagan administration economist who advised Trump on economic issues during the campaign and assisted in crafting Trump’s tax plan, Kudlow is already close to people in the White House. “Kudlow would be the grand prize,” Stephen Moore, a senior fellow at the Heritage Foundation who consulted with the Trump campaign told ABC News. "He would be a great spokesman and he's beloved by members of Congress." FreedomWorks President Adam Brandon said in a statement, "The White House deserves to have the finest economic minds in the room, and Larry Kudlow is the real deal." Peter Navarro, a protectionist who has pushed for the steep tariffs on steel and aluminum the White House plans to announce soon, has been floated as a potential replacement, although one source close to the White House said Navarro leading the NEC would roil the West Wing. Navarro has been a critic of China and the Trans-Pacific Partnership. Despite rumors he's under consideration, Navarro told Bloomberg News he’s "not on that list." Navarro said he already has "full plate" as director of the Office of Trade and Manufacturing. Mulvaney and Knight are two other possibilities from inside the White House. 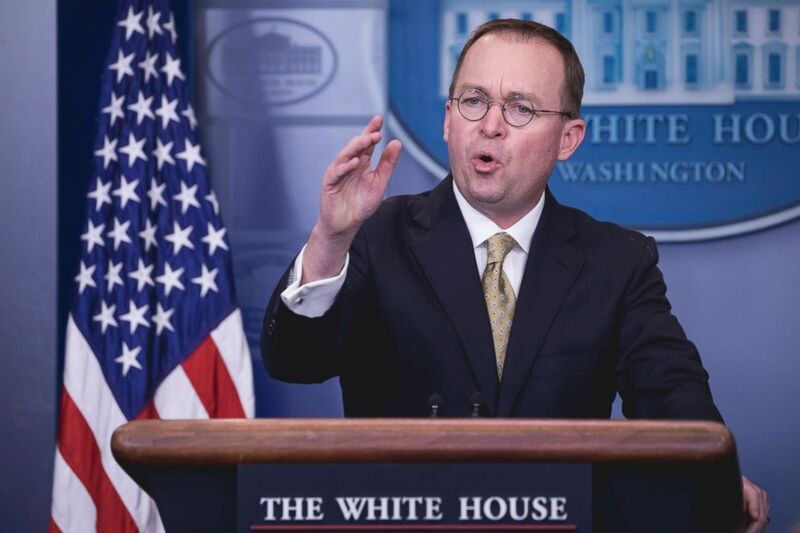 (Cheriss May/NurPhoto via Getty Images) Office of Management and Budget Director Mick Mulvaney speaks to press during a briefing on the government shutdown, January 20, 2018. As OMB director, Mulvaney has institutional knowledge of the West Wing and received praise for his handling of the White House budget. "He's smart and Trump likes him," said Moore. "But the thing about Mulvaney is that he's already doing a great job at OMB and he's already running the consumer finance protection board so he'd have to shuffle things around." Knight currently serves on the NEC as special assistant to the president for tax and retirement policy. A former executive at Fidelity Investments, she played an integral role in the roll out of the White House’s tax plan. Trump’s pick would oversee a highly respected staff within the White House. Whomever Trump picks could shake up a White House still reeling from the departure of other high profile staff members like communications director Hope Hicks and staff secretary Rob Porter. One source in close contact with the NEC office said there could be even more staff turnover. The source said staffers are worried about the direction of the White House’s economic policy. "People are worried Gary's departure signals a pretty significant shift in economic policy from this White House from what has been so far very sound economic policy that the broader conservative movement has been supportive of,” the source said. "They're very concerned about what’s happening inside the White House in terms of a more protectionist point of view gaining a foothold and the president being sympathetic to that thinking."